A cataract is a clouding of the eye’s lens that causes loss of vision. The lens lies behind the iris and the pupil. It works much like a camera lens. It focuses light onto the retina at the back of the eye, where an image is recorded. The lens also adjusts the eye’s focus, letting us see things clearly both up close and far away. The lens is made of mostly water and protein. The protein is arranged in a precise way that keeps the lens clear and allows light to pass through it. 3. When are you most likely to have a cataract? The term “age-related” is a little misleading. You don’t have to be a senior citizen to get this type of cataract. People can have an age-related cataract in their 40s and 50s. But during, middle age, most cataracts are small and do not affect vision. It is after age 60 that most cataracts steal vision. A cataract starts out small. It has little effect on vision at first. Cataract symptoms include blurred vision, like looking through a cloudy piece of glass. Another cataract symptom is light sensitivity and glare. A cataract may make light from the sun or a lamp seem too bright, causing a glare. Or, you may notice when you drive at night that the oncoming headlights cause more glare than before. Also, colors may not appear as bright to you as they once did. As the cataract gets bigger and clouds more of the lens (doctors use the term, “ripens”), you will find it harder to read and do other normal tasks. The word “cataract” means waterfall. For people with a ripe cataract, it is like trying to see through a waterfall. 5. How is a cataract detected? 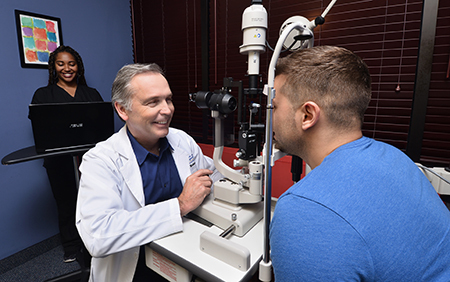 Although you might think you have a cataract because of your symptoms, the only way to know for sure is by having an eye examination. Should your eye care professional find one, he or she can monitor it and advise you about any further treatment. 6. How is a cataract treated? It is treated with surgery. Your eye care professional will remove your clouded lens and, in most cases, replace it with a clear, plastic lens. Cataract surgery is very successful in restoring vision. It is one of the most common surgeries performed in the United States, with over 1.5 million cataract surgeries done each year. 7. When should a cataract be treated? The National Eye Institute (NEI), one of the Federal government’s National Institutes of Health, supports research on the lens and age-related cataract. Most of these studies focus on controlling cataract with drugs so that surgery will not be needed. Although these drugs are not yet available to patients, research is moving forward in this area. NEI is also evaluating whether certain vitamins and minerals might prevent or slow the progress of cataract. We should know more about whether this treatment works in the coming years.